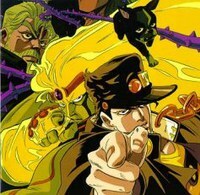 Plot Summary: Kujo Jotaro is a normal, popular Japanese high-schooler, until he thinks that he is possesed by a spirit, and locks himself in prison. After seeing his grandfather, Joseph Joestar, and fighting Joseph's friend Muhammad Abdul, Jotaro learns that the "Sprirt" is actually Star Platinum, his Stand, or fighting energy given a semi-solid form. Later, his mother gains a Stand, and becomes sick. Jotaro leanrs that it is because the vampire Dio Brando has been revived 100 years after his defeat to Jonathan Joestar, Jotaro's great-great-grandfather. Jotaro decides to join Joseph and Abdul in a trip to Egypt to defeat Dio once and for all. In order to keep the story in chronological order, the North American release begins with the second OVA (episodes 1 through 7) which came out in 2000, and then moves on to feature the first OVA (episodes 8 through 13) which came out in 1993, because the first OVA covers the second half of the story and the second OVA covers the first half of the story. Annamaria Mantovani as Suzie Q.